On Friday night Josh made grilled pizza for dinner. I was in charge of dessert:) I used the other half of the apricots from our neighbors tree to make sorbet. It was so easy and the texture was amazing! The sorbet is very creamy, but no cream or milk was needed. Just apricots, sugar, water, and a splash of vanilla. I am so glad our neighbors let us pick their apricots. This sorbet is heavenly! The perfect ending to a meal on a hot summer night. I love the descriptor "squishy." The sorbet sounds amazing. Fresh fruit sorbet… perfect for summer! Love apricots, so I'm guessing this is heavenly. 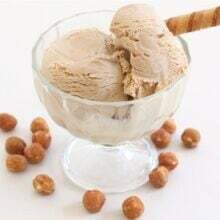 I will hav eto try this perfect summer dessert. Love the color too. Sounds delicious! I love apricots in the summer. Apricot sounds like a really fantastic sorbet flavour! Looks so good! I am going to have to pass this one to my parents since they have an overabundance of apricots. I love the photos- beautiful colors. That does look like a summer treat! good for u for taking (having) neighbors fruit! lol. love the sound of pizza and sorbet! Sounds very light and refreshing! Yum! Looks great!! It looks so refreshing and delightful! What a great idea, I have never had any type of ice cream or sorbet flavored with Apricot! I love the color of the sorbet! It looks so beautiful and refreshing… Great recipe! yum! I love apricots…especially fresh from a tree (the ones at the store don't even do this fruit justice). I really need to invest in an ice cream maker. You can just freeze in a pan and when frozen put in blender until smooth. Not as easy but it does work. oooo, I'll bet that is delish!! Too bad I don't have a machine…..
That looks delicious! I love the color. What a beautiful color for a refreshing treat! I hope you have a great week ahead Maria! I love how simple this is! Man I keep seeing so many good recipes that require an ice cream maker… I may need to break down and get one! Yum, that sounds so delicious and refreshing. it's gorgeous! i love the pale, pastel hue, and i think i'll always be up for some squishy-ripe apricots-turned-sorbet! Love apricots, love the color, love frozen treats. YUM. Gotta get my hands on some apricots. That sounds so good! What a perfectly refreshing flavor. I would love to try my hand at making this as well. This looks so pretty and refreshing – I know I would love it. oh, i feel refreshed just looking at the sorbet! i have got to get an ice cream maker! tried grilling a pizza today! ok, ok, so we're a few months behind. any tips on how to keep the pizza dough solid-like on the grill? mine got all stretchy and wonky. still yummy, but not cute. I need a treat like this today, looks so yum that apricot sorbet. Perfect end to a summer meal! Looks refreshing! Everyone must have loved it. 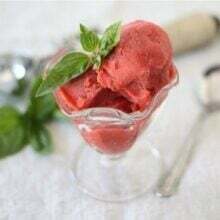 I love fruit sorbets and yours look so refreshing! Hope you have recovered from your weekend but it sounded like lots of fun. You know I don't think I've eaten an apricot. The color of your ice cream is gorgeous! What a lovely summery color! I love sorbet! This apricot version sounds so good, lately I have been making cantelope sorbet because they are so sweet from the market but I think I need to seek out some apricots. Yum, this is certainly a unique flavor for sorbet. Sounds delicious. I love apricot! That looks perfect! I can't believe your neighbors have an apricot tree. Man, am I jealous. Did you have to strain your apricots through a fine mesh strainer? What type of fine mesh strainer? Yes, I used a fine mesh strainer. You don't have to but it makes the texture much smoother! I have a cheap one, nothing special. I do't think I've ever seen apricot sorbet before – and it sounds fab! Maria, this looks so light and refreshing! I’ll have to try this as soon as apricots start appearing! Thanks for the link! I’ll be including it. Pingback: Chocolate Covered Strawberry Ice Cream Recipe and a Giveaway! This sounds delicious and such a gorgeous color! Beautiful sorbet! 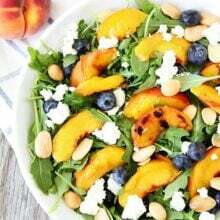 I love apricots; this is perfect for summer! This sorbet is gorgeous. Love the color! This sorbet looks so refreshing! It would be perfect on a hot summer day! What a fun way to enjoy apricots! I always get a bagful from our friends in the middle of the summer and some of them end up going rotten before we get to them. This would be a great way to use them up. I love love love sorbet. Such a wonderful, guilt-free summer treat. This looks gorgeous! Love that color. This sorbet is amazing! I think I used more apricots than the recipe calls for, because it pitted them first and them weighed them. But they started out as relatively flavorless and the cooking really concentrated the flavors. It’s perfect and I’m definitely making it again.